industries, which is refining a long-term strategy for wind energy with a pilot project for wind turbine rotor blade design. To ensure a proper concept for a certified rotor blade, the Airworks team needs to balance a variety of multidisciplinary optimizations (MDOs) — for example, creating models that couple aero-structural blade properties with wind flows and possible failure scenarios — in addition to performing stability analysis and evaluating materials and manufacturing time costs. On top of the sheer complexity of the blade design, there is the collaborative nature of the engineering process. It’s made all the more challenging given that AirWorks’ aerodynamics, load and mold design experts are based in Rome, and the system-level architecture, structure, manufacturing and project management domain experts reside more than 400 miles away in Trieste, Italy. The solution to both the design complexity and collaboration problem arrived in the form of Enterprise Suite, a new platform from ESTECO, which aims to simplify some of the challenges around MDO and multi-objective optimization. Launched mid-year, Enterprise Suite combines the advanced capabilities of the modeFRONTIER 4.5 multi-objective and MDO platform, with SOMO, ESTECO’s new framework for distributed execution and collaboration. The duo is designed to give engineering groups better control over the design of complex systems by helping them more effectively organize and manage critical simulation data — all while allowing a dispersed and varied team of domain experts and optimization and integration specialists to join forces to build advanced MDO workflows. Key to the pair’s power is a complete redesign that extends the modeFRONTIER desktop paradigm to a Web-based collaborative environment. The new approach means that multiple users, with different competencies and located at different sites, can more easily participate in the MDO process. They can share models and optimization strategies via a shared repository that can be accessed anywhere, anytime, with only a Web browser. SOMO’s Dashboard page lets users find More Information about their work, as well as direct links to the most recent resources. Consider a scenario where an aerodynamics specialist and a structural expert need to collaborate on the same design, but are located in different venues. They’re performing their individual modeling and optimization routines using siloed tools and with very disconnected workflows. Traditionally, these two would have to manually trade their different model files to work together — raising the risk of one party being saddled with incomplete data if a particular type of simulation or MDO changed along the way. Moreover, domain experts unfamiliar with how to create specific design of experiments (DOE) or optimization strategies in modeFRONTIER were shut out of the workflow, unable to contribute models to the greater cause or to reuse other experts’ MDO work because it was not easily accessible. Users can organize their work and data inside the SOMO shared repository using projects and workspaces. Users associate projects with one or more workspaces to control how project resources are shared among other users. With Enterprise Suite’s Web-based approach, however, project experts can participate in MDOs without knowing the details of that other discipline, and without the skills to create the integration and workflows. Moreover, by storing specialists’ optimization and design space exploration strategies in a single, structured database, companies protect their intellectual property, nurture a shared knowledgebase, and promote MDO reuse. Enterprise Suite also delivers innovations in the areas of distributed execution and post-processing analysis capabilities. With simulation and optimization continually hungry for additional compute power, ESTECO designed SOMO to support high-performance computing (HPC) systems and cloud environments so engineering groups can easily add more horsepower when needed. With SOMO, users can create a DOE or optimization plan for a given project, while having direct visibility to the most meaningful More Information from the generated session. In addition, SOMO will automatically execute simulations and optimizations across a number of nodes in a distributed fashion. It’s a process that is transparent to the user, thereby reducing the burden on IT, Nicolich says. Users can select where they want their task to be executed based on their role and privileges, or the software will automatically queue up and distribute jobs based on the requirements of the software, as well as the availability of computing resources. On the post-processing front, Enterprise Suite is stocked with an array of tools, including new data visualization capabilities and statistical analysis reports to help domain experts and other engineering collaborators make sense of the DOE and optimization findings. Because the Web-based system supports HTML5, users can access the charts and report capabilities on an array of devices, from laptops to tablets. 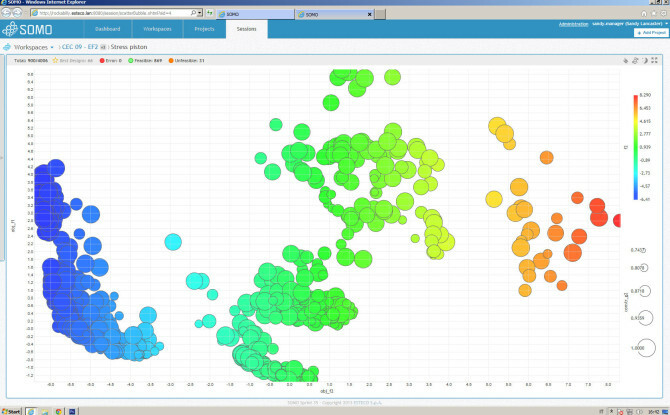 Visualization and analytical post-processing tools like this scatter bubble chart help users glean an understanding of complex datasets. Click for bigger image. While Airworks is still getting its feet wet with Enterprise Suite’s new capabilities, Picinich says the Web-based interfaces align perfectly with the firm’s working style and is likely to make the collaboration process a lot easier. More to the point, though, he sees Enterprise Suite opening doors to new design innovations, whether related to wind turbine blade design or in Airworks’ other core areas of focus. “The platform gives our people the freedom to think about how to improve the product, rather than occupy their minds with issues that have more to do with logistics like relocating from one office to another or checking an FTP for new data,” he explains.